Melinda Clayton is an odd mix of psychotherapist and writer who has always loved to read, and who loves to explore the motivations behind difficult choices and decisions. She has an Ed.D. in Special Education Administration, and is a licensed psychotherapist in the states of Florida and Colorado. Her vast experience working in the field of mental health gives her a unique perspective on human behaviors. Clayton lives in central Florida with her husband, two children, and various cats. She is the author of Appalachian Justice and Return to Crutcher Mountain. Learn more at her website or at her Goodreads author site. After the mysterious death of their brother Luke at the age of thirteen, seventeen year-old Beth and her younger sister Naomi ran away from home, planning to never return. Beth Sloan has spent the majority of her life trying to escape the memories of a difficult childhood. Born into the infamous Pritchett family of Cedar Hollow, West Virginia, she grew up hard, surrounded not only by homemade stills and corn liquor, but by an impoverished family that more often than not preferred life on the wrong side of the law. Beth manages to suppress the painful memories and create a comfortable, if troubled, life with her husband Mark and their two children in an upscale suburb outside ofMemphis, Tennessee. Twenty-seven years later old resentments and family secrets are awakened by a letter from Kay Langley that their mother is dying and it is time to make amends. Beth, at the urging of her sister Naomi, agrees to return to Cedar Hollow risking everything to finally face the truth about what happened to Luke that long ago summer night. Told through multiple points of view, Ms Clayton does an excellent job devoting each chapter to a single character in this heart-wrenching story. She takes us on an emotional journey into the past of a dysfunctional, but proud family, to discover how abuse affects all members of a family and the dynamics of the abuse that surrounds them. By singling out and developing each character individually she explores how these cycles tend to continue, how the courageous ones try to break the cycle, and how things are not always the way they seem. Not many authors have the expertise to accomplish this without making judgments the way Ms Clayton does. I love the style in which this story is written, through inner dialogue, we are allowed to feel what each character is feeling and gain an understanding of why things are the way they are and how each character perceives them. We are also given insight through the eyes of Kay Langley, the owner of the local café that serves as the town’s hub. Through her eyes we see a caring outsider’s view of how the town views this family and its individual members. One of my favorite elements of this story is the fact that Beth took her seventeen year-old daughter, Marissa, along with her on this difficult trip to face her ghosts. With Marissa along we are given three generations of view points. This character driven story flows well considering we are getting the story from five different characters. It is incredibly well told and I enjoyed my trip back to Cedar Hollows. There is a definite feeling of hope as this story draws to an end and I found it inspiring. I will share this book with my daughters and grand daughters. One of the things I appreciate about reading a hard story like this one is it makes me reevaluate my life and I realize my life is not so bad after all; things could be a whole lot worse. 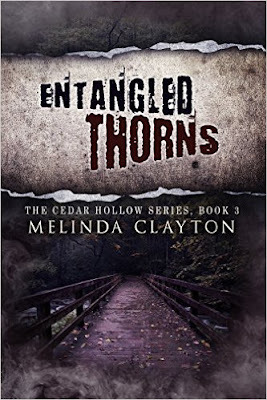 Melinda Clayton has won herself a spot on my ‘must buy’ list for future books. Although this is the third book about Cedar Hollow Ms Clayton has written, I believe it can be read as a standalone story. You may miss some of the richness of the minor characters or of the area in general in doing so though. At the end of this story Ms Clayton has included questions for book clubs to consider after reading her book. This would be a great book for discussion because everyone has their own story and view point and I am sure everyone can identify with one of more of the characters in this book. I know I did. I noticed NONE at all.